The injury bug has made its way through the lineup, but it bit likely the most important piece of the St. Louis Blues’ lineup on Saturday night. In the middle of the second period of the Blues’ 6-0 victory over the Edmonton Oilers, Alexander Steen left the game with what the team called an upper-body injury. There was no singular incident that stood out as the reason for his departure. 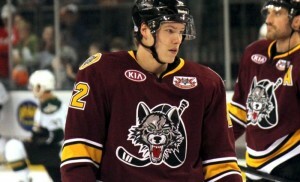 In his place, the Blues have recalled forward Dmitrij Jaskin from the Chicago Wolves. Jaskin has played in 20 AHL games this season, recording nine goals and 17 points. Jaskin is traveling from Chicago, where the Wolves wrapped up a three-game homestand Sunday night, weighing the chances that he arrives in Calgary by Monday evening in the Blues’ favor. 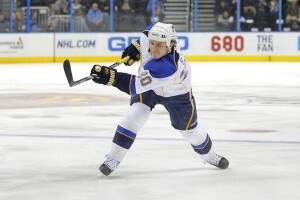 The 2011 second-round draft selection has proven in the past to be a supreme scoring talent in North American hockey. While playing with QMJHL Moncton during the 2012-13 season, Jaskin scorched the league for 46 goals and 99 points in 51 games. Despite missing time to play with the Czech National Team in the 2013 World Junior Championship, Jaskin led his team in both categories and finished fifth in the points race. The Blues are starting to see the other lines roll at a consistent pace, as well. Chris Stewart has found his scoring touch, accumulating eight goals and 10 points in his past six games. This includes a hat-trick performance in Saturday’s win. Derek Roy has also been at the forefront of the offense, adding nine points in his last nine games. He finds himself in fourth on the roster with 27 points on the season. Although the Blues would be better served to have their leading scorer in the lineup, there doesn’t appear to be a lack of offense.